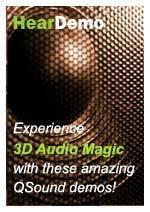 Hear some music with one of the smallest audio engines in the world! It might just sound like regular music to you, but this demo is played by mQSynth which is the polyphonic wavetable synthesizer of QSound’s microQ digital audio engine used in software constrained mobile phones. Polyringer demo of mQSynth playing a MIDI ringtone music file composed right here at QSound's StudioQ. Copyright © 2009 QSound Labs, Inc.